Then, if something has been selected on either table, in my filter of ALL(Fruit1) I’m allowing a row to pass through the filter if the value of FruitKey is present in the user-selections on Fruit1 or Fruit2. This preserves the original selection on Fruit1 and adds the selection on Fruit2 to it. 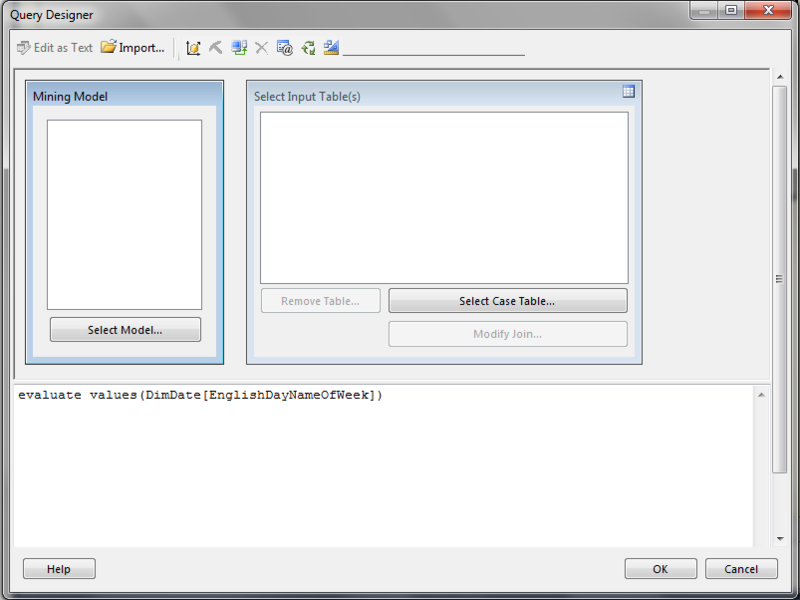 It would be much easier to do this if there was a way of unioning table expressions in DAX! 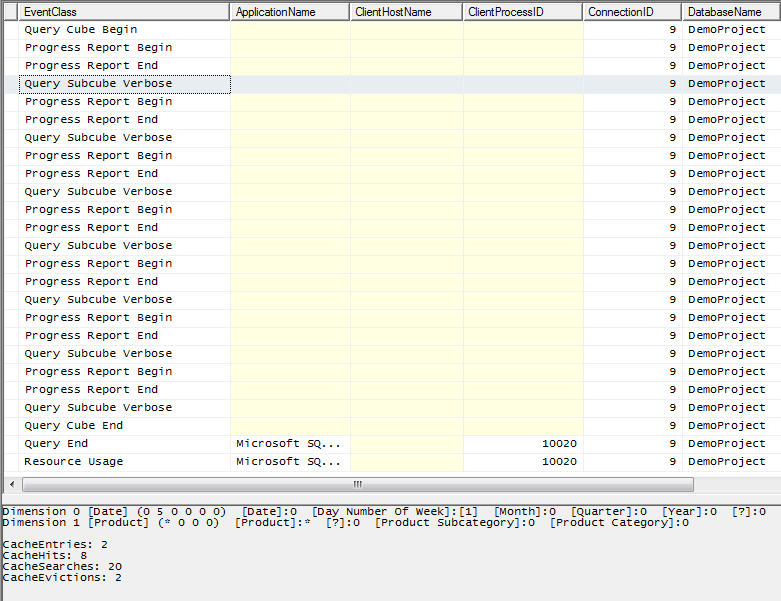 Finally, I’m using the resulting table in the CALCULATE() function to get the sum of Sales for that selection. If nothing has been selected, however, the outer IF() simply returns the sum of Sales Amount with none of this logic applied. I’m not sure this is the most elegant solution to this problem… if I think of one I’ll blog about it, and if you can think of one then please leave a comment! Simple time series calculations, such as comparing sales in the current year with the previous year, are easy to do in DAX and well-documented. 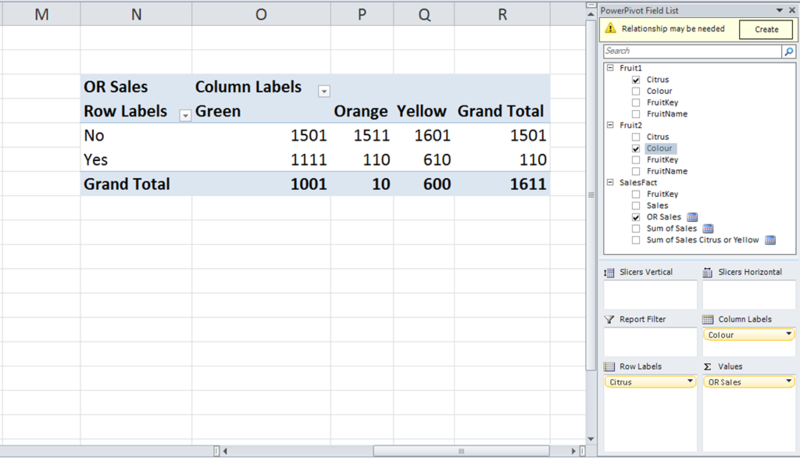 What happens if, in PowerPivot or the SSAS 2012 Tabular model, you want to compare the sales in any two arbitrary time periods – for example you want to compare (and maybe find the growth from) sales in January last year and February this year? In this case I loaded DimDate and FactInternetSales and created an active relationship between the two tables on OrderDateKey=DateKey. I then loaded DimDate again, called it DimDateCompare, and created another relationship between it and FactInternetSales on OrderDateKey=DateKey but set this second relationship as inactive. This means that any selection on DimDateCompare will be ignored unless the relationship between it and FactInternetSales is activated using the UseRelationship() function. I have CalendarYear from DimDate on the rows of the PivotTable and CalendarYear from DimDateCompare on the Slicer. The Sum of Sales Amount measure shows, as you would expect, the sum of sales for each year on DimDate; the Sum of Sales Amount for Comparison Period ignores what’s on rows and returns the sum of sales for the two years selected on DimDateComparison, ie 2001 and 2002. This is £3,266,373.66 + £6,530,343.53 = £9,796,717.18; and Difference shows the second of these values subtracted from the first. Not a very interesting calculation in itself perhaps, but I’m intrigued by the possibilities of having tables in the model that only have inactive relationships with other tables; up to now I’ve only used inactive relationships in scenarios where there have been another active relationship between the same two tables, for example as described in Kasper’s post here. If you’re reading this outside the US, why should you care about what PASS is doing here? I know from my involvement with SQLBits that a lot of good things can be accomplished at the national level without the direct involvement of PASS; but I also know from my involvement with SQLBits that at a certain point the benefits of international co-operation between different SQL Server communities becomes clear, and that the only body that can co-ordinate these activities is PASS. I don’t want to see PASS assume day-to-day control over every single aspect of the SQL Server community everywhere in the world and I doubt that would ever happen, but I do want to see PASS active in providing help and support to foster the growth of national SQL Server communities when it is needed and requested. I believe that can only happen effectively if PASS has an international leadership. So if you’ve ever been to a SQLBits, a SQLRally, a SQL Saturday, a user group or any other SQL Server community event and thought it was worthwhile then I’d urge you to get involved. Join PASS if you aren’t already a member (it’s easy and free), vote for the people you think will represent your views and needs, and make your voice heard. It will benefit PASS, it will benefit your local SQL Server community and ultimately it will benefit you. Last year I blogged about using DAX queries inside SSRS reports but one topic I didn’t touch on was how to handle parameters. 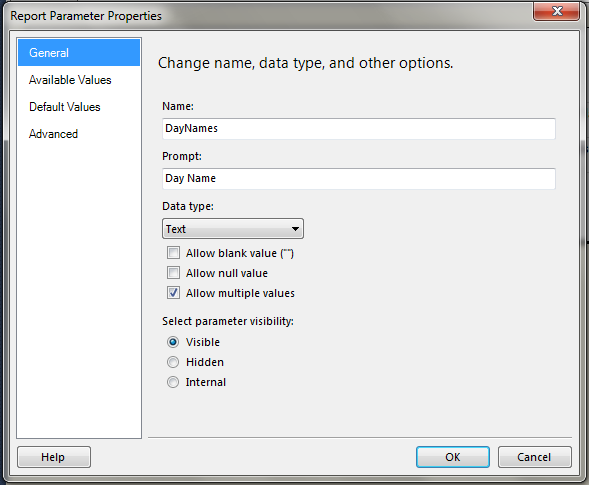 Marco wrote a post on using parameters in DAX earlier this year but didn’t cover how to handle multi-valued parameters in SSRS, so I thought I’d write a post to fill that gap. 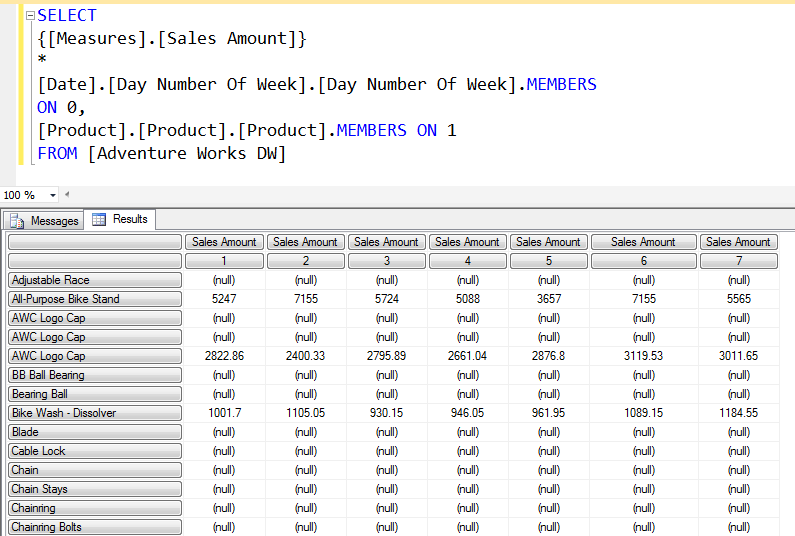 Let’s start by assuming you’ve built a simple SSAS 2012 Tabular model that contains the DimDate table from Adventure Works, that you want to build an SSRS report that shows data from that table and you want to parameterise that report by the values in the EnglishDayNameOfWeek column, ie by day. 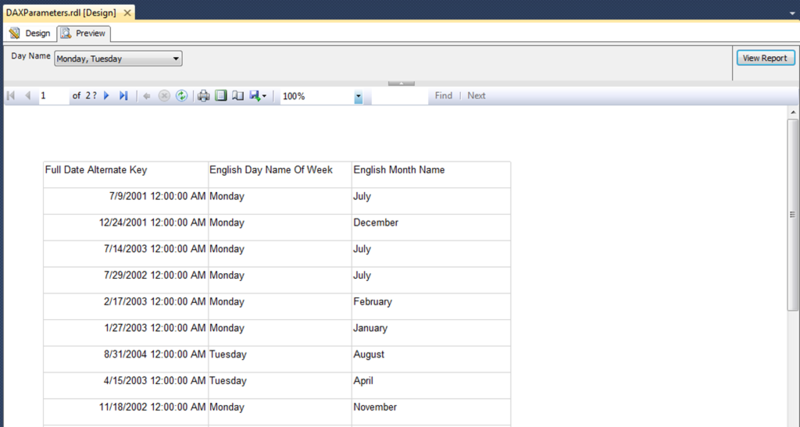 This query returns the whole of the DimDate table filtered where EnglishDayNameOfWeek is Monday. 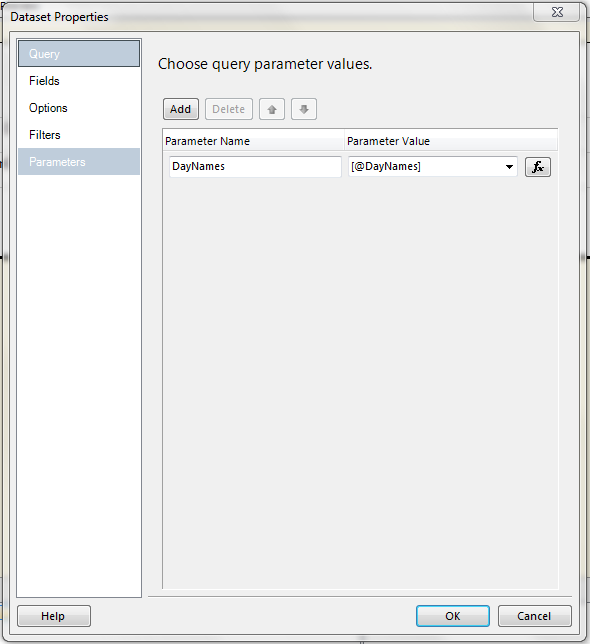 Since there is no way of doing an IN in DAX, you might be able to guess what the big problem that needs to solved when handling multi-value parameters in DAX is: with this style of query, for each parameter value that is selected you need to add a new OR condition and the only way of doing that is to generate the query dynamically. While that’s perfectly possible in SSRS it’s something you may want to avoid because it makes report development awkward. 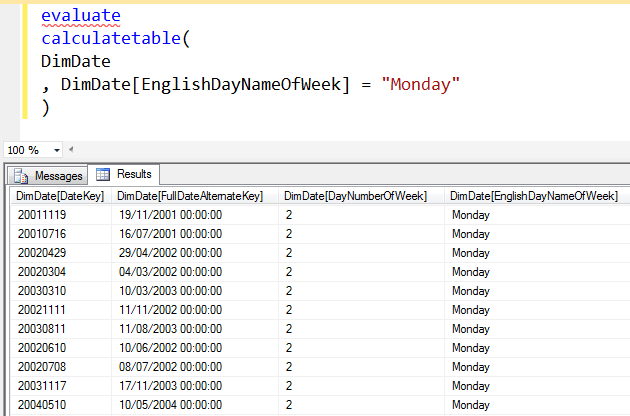 Here, I’m only filtering the table of distinct values in the EnglishDayNameOfWeek column (which has only got 7 rows), and then taking that table and using it as a filter with the calculatetable() function on the main DimDate table. In this case there’s still a callback but only on a filter on a relatively small table, and the filter on the larger table, DimDate, is performed in the most efficient way possible. 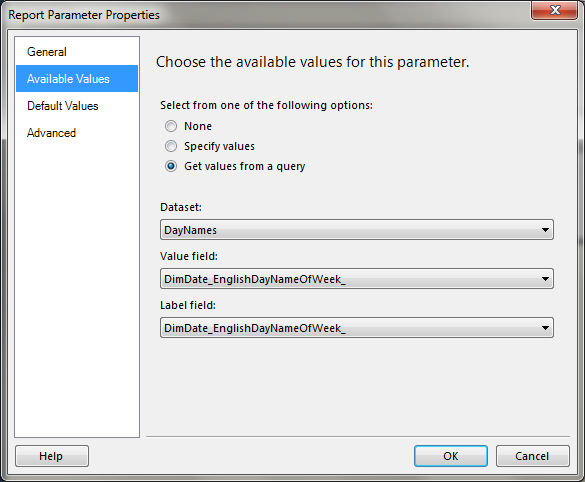 This, then, can be used to provide the available values for an SSRS multi-valued parameter. 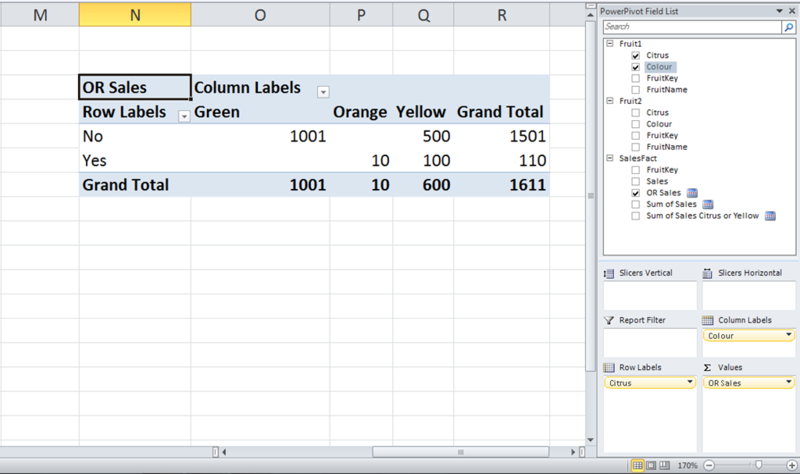 This should all be straightforward for anyone who has used SSRS before. It’s pretty simple: I’m using Substitute() to remove the opening and closing braces, and to turn the commas into pipes. 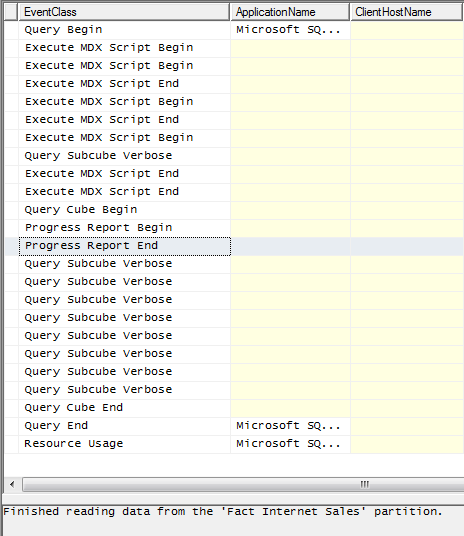 With that done, you now have an SSRS report using a DAX query that can handle multi-valued parameters!